OmiCronFX : Is Forex safer than the DOW? 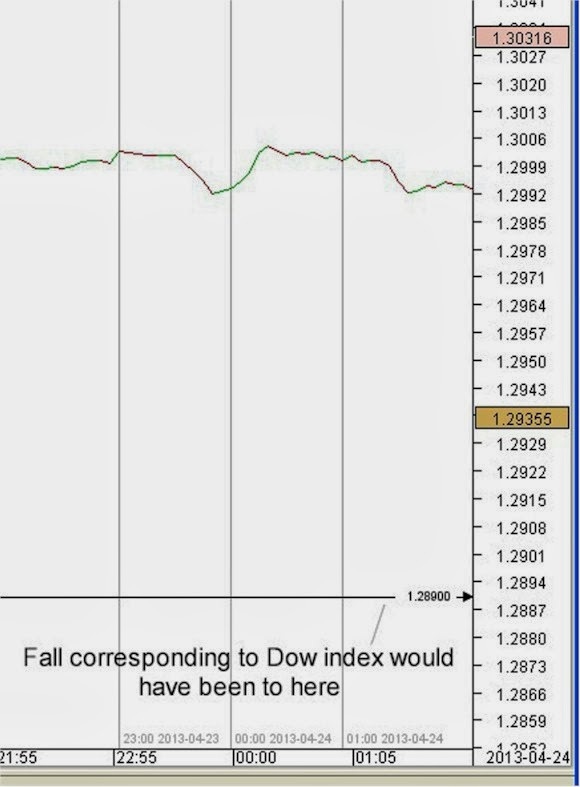 Is Forex safer than the DOW? On the afternoon of Tuesday April 23rd 2013 in New York, a fake tweet from a hacked Associated Press (AP) Twitter account indicated that there had been explosions at the White House in Washington and that President Obama had been injured. This caused a knee jerk reaction in the futures indexes, most notably that of the Dow Jones (see above chart from the Wall Street Journal). 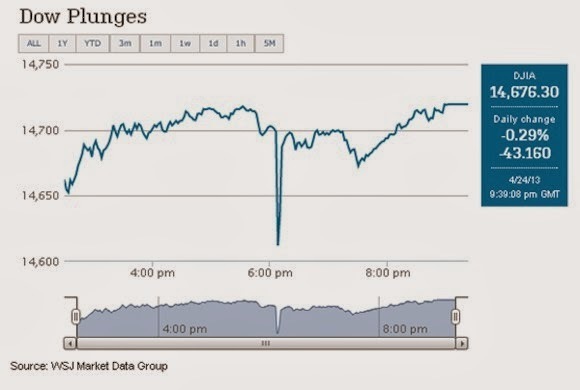 The tweet was rapidly recognised as a hoax, and the market returned to normal. However, there is no indication that traders whose positions were stopped out by this remarkable, and scary, surge to the downside were restored to where they were prior to the plunge. If they were not, then this most definitely caused mayhem in those accounts that trade the indexes, especially those that are traded with the use of leverage. It can be seen that any movement in price was well within the bounds of normal trading. This, we believe, is a measure of the liquidity that exists in the Foreign Exchange trading market and one of the things that makes it safer for trading.